Time for another edition of Throwback Thursday here on the Horns Up blog! This week, our #tbt pays tribute to a metal icon celebrating his 56th birthday today. That icon is none other than singer Bruce Dickinson of the mighty Iron Maiden! Bruce Dickinson – frontman extraordinaire, writer, radio host, pilot, occasional fencer, and now…56-year-old. Hard to believe. 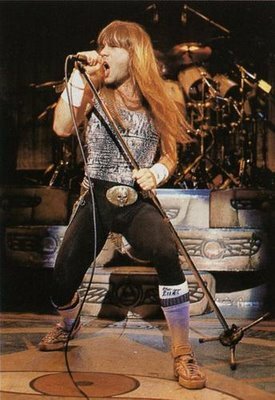 It’d be so easy to pay tribute to him by highlighting a tune from Maiden’s golden years–say, something off Powerslave, which turns 30 (!!!) in less than a month. But while that’d certainly show off Bruce’s tremendous influence in the metal world, it’d hardly be a testament to his longevity as a vocal force. In all seriousness, if you don’t get chills as Bruce belts out “blood is falling like rain” (actually it’s more like BLOOOOD IS FALLLLLLLING LIIIIKE-A RAAAAAAIN!) after the solo section, I’m pretty sure you’re not actually a human being. Also, this is your regularly scheduled reminder that Dance of Death is a goddamn awesome album, and anyone who tells you otherwise can play the game face-punch. So that’ll do it. Happy birthday, Bruce, and keep on belting!